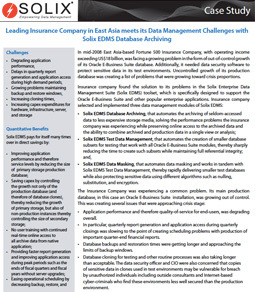 In mid-2008 East Asia-based Fortune 500 Insurance Company, with operating income exceeding US$18 billion, was facing a growing problem in the form of out-of-control growth of its Oracle E-Business Suite database. Additionally, it needed data security software to protect sensitive data in its test environments. Uncontrolled growth of its production database was creating a list of problems that were growing toward crisis proportions.